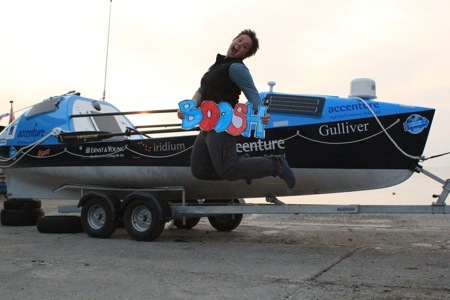 One little week to go now until Gulliver and I head East across the big blue. Gulp. And the biggest of ‘Whoop whoops!’ too. These are exciting, slightly stressful and adrenaline-fuelled times now as I zone in on the start, signing out of land life bit by bit. It is as much mental as physical – there is a To Do List of tasks to tick off, and also a state I need to get to, where I am on my way to becoming an ocean beast again. I feel a little bit like I am in limbo – not quite signed out and yet not quite ready to go yet. But we are getting there. The To Do List is manageable, the week ahead as planned out as it can be and a wonderful network of people helping me out to sea. If you are one of those, in whatever way that might be, thank you. Arigatou gozaimasu. After two weeks of delicious R&R with my wonderful Mum and the lovely Kris and Maren Hallenga, interspersed with packing, parties, interviews and boat tinkering, I am now up in Choshi, Chiba. Back in November last year I dipped my toe in the Pacific at Choshi Marina, having cycled and kayaked all the way from London. It is from that point that I shall push off in just a week’s time. 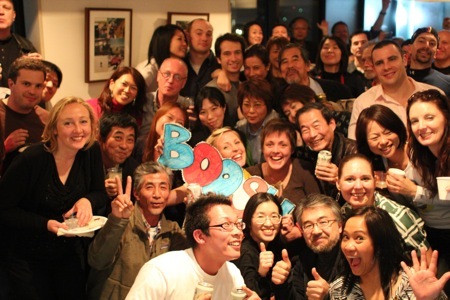 Yesterday Gulliver arrived at the Marina by truck and I followed on today, via Tokyo for friends and more farewells. Leaving my little home by the sea at Kasa Zima Marina yesterday was rather emotional – the lovely Otake-san and his wife, family and staff now feel like my own family – so it was with teary eyes that I bade my neighbour Fuji-san cheerio and promised I would be back again one day. It was a beautiful day and Fuji-san peered out through a crown of white clouds all day, bathed in gold as the sun wet down. I feel so very lucky to have lived just across the water from such a fine and iconic mountain, surrounded by warmth and friendship. It’s not all about the farewells at the moment, however. There is also a welcome to make. And that is to Ricardo Diniz, who many of you will remember from my Indian row. 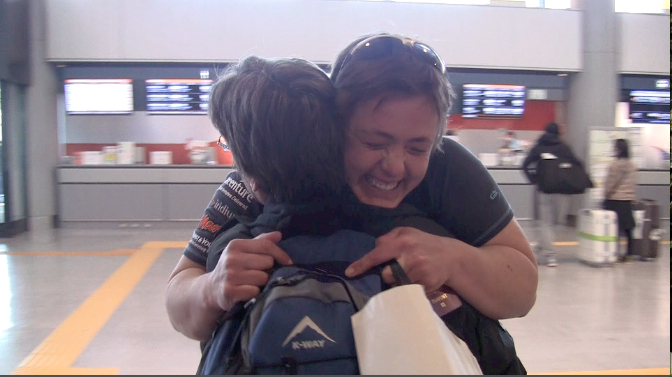 I was very sorry to hear a few weeks ago that the indomitable Justine wouldn’t be able to join me in Japan to support my final week of preparation, after taking a rather serious tumble from her bike and puncturing her lung. She is mending well but flying isn’t sensible, so she has promised to recover fully and be ready to greet me on the other side of the blue! I am happy that Ricardo was able to step into the role. He is due any minute now…. I am due a chat with my weather router Lee on Monday to look at the forecasts. We are aiming for a Friday morning departure if possible. “Good weather” just means as stable a pressure system as we can get, blowing offshore – ideally for a few days, creating the best window possible for Gulliver and I to get safely out to sea and away from land. Still can’t believe that you won’t be coming through that blue door for a while now! The big day is approaching, Little Mouse! So excited for you. May the last few days be smooth. Prepare on and see you soon! Sarah! I’m so excited for you about to set off across that big old ocean. I’m sad not to be there to fill you with a last few pancakes & hide a few tasty surprises at the back of your hatches. But I am so happy for you that the next stage is about to start. I look forward to welcoming you to North America with a cackle and a whoop in a few months time and helping you with whatever tasks need doing – with the possible exception of attending to the inevitable blistered bottom!! Go girl!! And take care of Gulliver! Hope your final week on land goes well and that you and Gulliver have a wonderful adventure as you cross the Pacific. Wishing you good currents, soft winds on your stern, and interesting plankton in your net. Looking forward to seeing you on this side of the Pacific in the fall. Big HUGS mt little girl. I know that you will do it!!!! Everything will be crossed for you for your safe departure and crossing of that mighty ocean., the Pacific……may she hold you GENTLY in her arms until you reach Vancouver………..which is where we shall meet again and have a PROPER HUG once again!!!!! Bless you on your journey and Thank for you for courage. Thanks also to EVERYONE that has made this possible, and stretched the limits of what is is to be human! Well, things are really hotting up for you and Gulliver, you will take care of each other and go for it. All our thoughts will be with you from the band of Isle of Wight followers. Have a wonderful row – the very best of luck to you. Fantastic News..fingers crossed for the weather window on Friday ….wise not to choose the 13th! all inspiring stuff as usual, you are a force of nature! and I look forward to reading your watery blogs once again, go well across the mighty ocean…stop off in Hawaii if you get tired…paradise! Sounds like a roller-coaster of emotion this last while. You now have to get back a solitary focus before leaving. No-one is more capable, so I’m not worried. It’s wonderful to see you so happy. See you on the Canadian shore. Just wanted to wish you well for your next poart of your wonderful journey, so glad that you had such a great time with your mUm and then Kris and her sister. Most of the commemnts have already been said but we shall look forward to your news. What a wonderful courageous person you are. All good wishes for whatever is thrust upon you, we know that you will be able to do it. Much love, take great care but enjoy it. We along with lots of folks will look ofrward to heraibg about your travels. Good going Sarah! Braver girl than me, by far! Good luck on your crossing! As you paddle into Vancouver, I’ll point you out to my son (around 14 months old when you arrive) and show him that there aren’t any limits to what you can do, once you put your mind to it … you can even paddle across oceans! Thanks Guy. What a wonderful message for your son. See you on the other side! 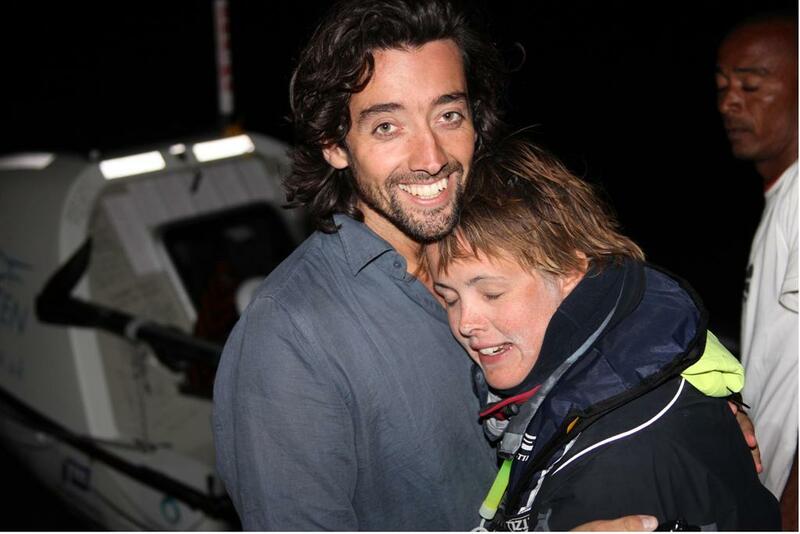 Good luck Sarah, hope the winds are fair and the swells kind. I hope ocean will be kind to you as the big piece of land you cycled across before. My mom, dad and I… and our neigbours whom I keep updating about your wonderful adventure wish you the very best luck and safe journey. Thank you Sasha. I came across some Kazakhstan photos the other day and smiled as I remembered the day you and your Dad tracked out of Almaty. I hope all is well! Send my love to Kazakhstan..
Also wish the best luck to Justine and quick recovery! You’re looking fit, settled and strong. Go well, row well, that girl. Be safe and come back to Rutland one day! Sounds like you had wonderful friends and support in Japan. Greetings to Ricardo too. Sorry you’re not fit, Justine. Get well soon. What a year you have had! Now the next stage of your amazing adventure is about to unfold. Looking forward to hearing more stories and reports from your round the world trip. Awesome ….. I am in awe of you. Good luck in this great journey! The spirits of nature is obvious favor to you. But we still ask ivoi s for you. Your colleagues from the island of Sakhalin. Alex and Julia Yemchenko.